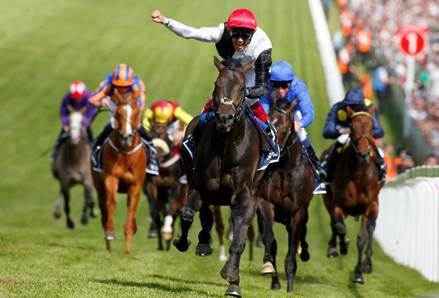 Golden Horn wins the 2015 Investec Derby. (Pic: Courtesy of Great British Racing). By Simon Jackson in Paris. The clash everyone had hoped for is on as dual Prix de l’Arc de Triomphe heroine Treve takes on Investec Derby winner Golden Horn in this year’s Arc at Longchamp on Sunday. Treve bids to become the first horse to win the Arc three times and despite having an undeniably great chance of creating history after winning all of her three starts this season, her trainer Criquette Head-Maarek is taking nothing for granted. “There are some good three-year-old colts coming from England and there’s [French Derby winner] New Bay here, it’s not done yet. She’ll have to really go for it. It’s not done yet,” Head-Maarek told At The Races. Treve has long had a stranglehold on the Arc betting is best-priced at 11-10 and is selected to win the Arc for third time – but punters seeking a more robust return may be forced to look elsewhere. Golden Horn (5-1) is the obvious place to start. His owner Anthony Oppenheimer anticipates a big run as the ground continues to dry at Longchamp. “I’m delighted to take her [Treve] on and I really, seriously believe if we had firm ground, or good to firm, we’d win easily,” said Oppenheimer, who on Thursday paid a €120,000 supplementary entry fee to add Golden Horn to the Arc field. Yet Golden Horn’s defeat at York in August at his penultimate start ended his unbeaten record and like French Derby winner New Bay (5-1), may be forced to settle for one of the minor places. However a runner worth noting for each way backers looking for a bigger price is New Bay’s stablemate Flintshire (20-1) who finished second to Treve in last year’s Arc and represents good value. Flintshire finished two lengths behind Treve and comes here in good form after winning the Grade 1 Sword Dancer Stakes at Saratoga last month and has been supported this week. “Flintshire is suited by fast ground and each-way punters have backed him to take advantage of the drying conditions at Longchamp,” Betfred spokesman Andrew Griffiths said earlier this week. Free Eagle (16-1) is another who looks good value for each way punters. The lightly raced four-year-old won the Prince Of Wales’s Stakes at Royal Ascot and was third to Golden Horn in the Qipco Irish Champion Stakes, where he was badly hampered by the winner inside the final furlong.